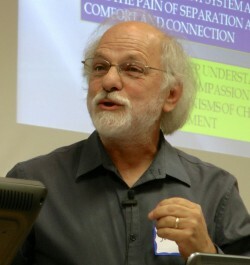 Jonathan Baylin has been working in the mental health field for 35 years. For the past fifteen years, while continuing his clinical practice, he has immersed himself in the study of neurobiology and in teaching mental health practitioners about the brain. He has given numerous workshops for mental health professionals on ‘Putting the Brain in Therapy’. Several years ago, Jonathan began a collaborative relationship with Dan Hughes and their book, Brain Based Parenting, was released by Norton Press in 2012 as part of the Norton series on Interpersonal Neurobiology. Jonathan has delivered keynote sessions at international conferences and has also given numerous workshops both internationally and regionally within the USA. Jon wrote this brief article for the website while working on his next publication with Dan Hughes, about the neurobiology of how attachment focused therapy "works”, due out in Autumn, 2015. We would like to thank Jon for writing this short article for DDP network.